Become Proficient in Crafting Your Authentic Personal Branding Statement with Marge Powers’ Latest Aha Amplifier™ Book | THiNKaha: Become a recognized expert in your field of expertise. Compelling thought leadership content. Marge Powers, eczema an author of over 50 books, read more shared well-thought-out messages on how to create a vibrant, reputable brand statement that generates chemistry. CUPERTINO, CA – May 2, 2016 – What characteristics do you possess that differentiates you from everyone else? What set of attributes, passion, and strengths are you known for that drives you at work and in life? In order for your brand to work for you in your job search, you have to craft a crystal clear personal message that communicates who you are in the marketplace. You need to create a branding statement that delivers the goods. But how? Marge Powers, founder and owner of Winning Ways, a career and life management coaching firm, shares valuable thoughts on how to brand yourself authentically in order to beat your competition. She helps individuals boost their own confidence by defining who they are, what they stand for, and how they can contribute to an organization, company, or community. She is committed to working with people who are interested in growing and want to be satisfied in a life that works best for them. “Creating a truly outstanding brand statement that distinguishes you from the rest will make you hit home and fascinate the decision makers that you’re trying to influence. This AHAbook™ serves as an agreeable approach that helps people uncover a message that dazzles your personal and professional history,” says Mitchell Levy, Chief Instigator of AHAs and CEO of THiNKAHA. Are you a great leader, organizer, or communicator? Then drum up sentences that will knock on readers. Bring in your passion, accomplishments, and vision in creating your broad umbrella that encompasses all of your specific goals. 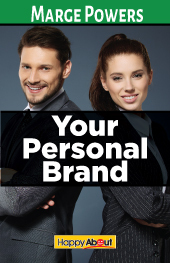 Marge Powers on Personal Branding is an easy-to-read epitome that consists a bound set of action points that help individuals bang potential employers. Register or use the Aha Amplifier as a guest to learn about “Marge Powers on Personal Branding" and start sharing Marge's AHAmessages with a click of a mouse at http://aha.pub/personalbrand or browse, buy, download, and read her book’s Kindle version at http://www.amazon.com/Your-Personal-Brand-Branding-Statement-ebook/dp/B01COTSFH4/. The Aha Amplifier is the first 100% curated thought leadership platform containing over 30k AHAmessages that are easily shared on Twitter, Facebook, LinkedIn, and Google+. Over 95% of the AHAbooks (contain 140 AHAmessages) are free to read and share. The Aha Amplifier makes it easy to create, organize, and share your own thought leadership messages in digestible, bite-sized morsels. With this platform, anyone can: 1) Easily find and share content that their community is interested in. 2) Write a book and become a recognized expert among their community while expanding their reach. 3) Make it easy for any fan or advocate to share their bite-sized morsels on social media. The experience of many authors is that they have been able to write their books in less than a day.